Below are some extracts of a very interesting work on cartoons during the Soviet era. This is obviously written with a Western hand, but I enjoy this type of untold History… Always enlightening! When I was a child, our family had a prize possession that my sister and I could only use on special occasions. Known as “the sick puzzle,” it contained 81 one-inch wooden cubes whose individual sides had been painted red, white, blue, or yellow. The house rule was simple: the only time you were allowed to play with the sick puzzle was when you were actually sick. Although my sister and I knew exactly where to find the sick puzzle, we always respected the rules of usage. As such, there was one toy that became a family heirloom and was put back into use soon after my niece and nephew were born. To this day, the mere mention of the sick puzzle can provoke a twinge of nostalgia for something that held a very special place in our hearts. 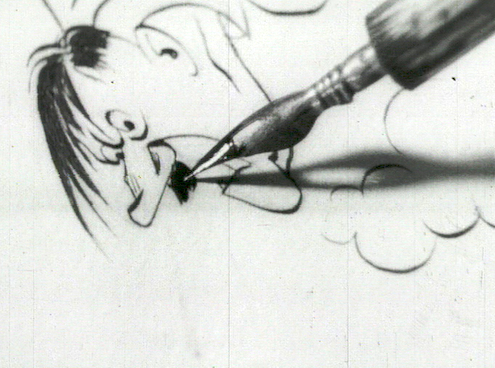 For many people, cartoon art holds a similar function. Different generations embrace different cartoons. Thus, the people who grew up reading Peanuts, Archie, B.C., and Dennis the Menace may have very different tastes and sensitivities than those who were raised during the heyday of Blondie, Ferd’nand, Pogo, and The Little King. While I’m currently drawn to Pearls Before Swine and Get Fuzzy, there is a special place in my heart for Berkeley Breathed’s ferociously brilliant Bloom County and, of course, Bill Watterson’s hilarious Calvin and Hobbes. Whenever I’m feeling down or need a pick-me-up, all I have to do is open up one of my coffee table books of Calvin and Hobbes cartoons to be brought back to “a happy place.” Fifteen years after Watterson chose to discontinue his beloved comic strip, visions of Spaceman Spiff, Calvin’s diabolical snowman creations, or Miss Wormwood can instantly bring a smile to my face. The same holds true for images of Opus the Penguin, Bill the Cat, Gary Larson’s demented animals, and other figments of a cartoonist’s imagination that became cultural landmarks for so many of us. All of these, however, reflect American culture. Most of us know very little about the history of cartoon art in the Soviet Union — especially political cartoons. During interviews with Boris Efimov (who died in 2008 at the age of 109), viewers of Stalin Thought of You will be astounded by how spry and alert the artist was at 104. Whether having his picture taken flanked by two statuesque blondes or examining a fellow artist’s renditions of Stalin and other famous Russians, Efimov enjoyed a long life. He offers viewers a remarkable perspective on Russian politics throughout the course of the 20th century. 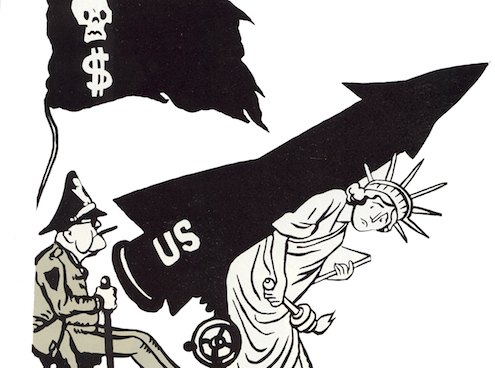 Efimov’s political cartoons depicted Soviet politicians and their henchman from Stalin through Brezhnev, with plenty of drawings depicting Americans like Franklin Delano Roosevelt and George W. Bush. Sketches of controversial figures like Adolf Hitler and Leon Trotsky flowed freely from Efimov’s fingers. Using rarely seen footage from the Russian State Film Archives, documentarian Kevin McNeer (with help from the Soyuz Multifilm Animation Studio) has produced a fascinating documentary. What makes it even more interesting is that, during his interviews with Efimov, McNeer doesn’t quite seem to grasp how oppressive life really was under Stalin. Efimov’s older brother, Mikhail Koltsov, was a Soviet spy and journalist who was much admired by Ernest Hemingway for his work in Spain (Koltsov inspired the character of Karkov in Hemingway’s novel.For Whom The Bell Tolls). While Koltsov’s ambition eventually led to his execution under Stalin’s regime, Efimov was allowed to live. When the Nazis invaded Russia, Efimov was one of the Russians that Hitler’s troops had orders to hang upon capture. Although he had been blacklisted as the relative of a dissident, Efimov was spared exile in a Gulag and was eventually reinstated as Pravda’s top political cartoonist. Stalin was such a big fan of Efimov’s work that he would even make suggestions on how Efimov should draw certain characters like Dwight D. Eisenhower. Like the best political cartoonists, Efimov mocked authority in the Russian press during a lengthy career that spanned most of the 20th century. He was lampooning events during World War II as well as during the Cold War. Although his cartoon work for Russia’s state-owned media helped keep him alive, he never recovered from the emotional wound of his brother’s murder. As a result, Efimov’s descriptions of the power struggles within the Kremlin bear personal witness to many of the changes that occurred within its walls. Nearly a century after his death, communist leader Vladimir Lenin still rests in a glass display case on Red Square, his embalmed body a stark counterpoint to Russia’s latest modernisation effort. The controversial idea of burying Lenin has been a permanent feature of Russian politics since the Soviet Union’s fall in 1991, when millions happily parted ways with a system that had outlived its times. But so far, no one has dared take the ultimate step of so dramatically breaking links with a leader who introduced Russia to both the promises of communism and the horrors of Gulag death camps. While Russia tries to present a modern new image under its iPad-toting President Dmitry Medvedev, tens of thousands of people still come every year to see the communist founder, his finely-coiffed body reclining in a sarcophagus. This dissonance seems to be needling the ruling United Russia party on the eve of December parliamentary elections, with several officials leading calls for Lenin to be laid to rest alongside his mother in Saint Petersburg. “I do not see a single thing standing in the way of his burial,” United Russia lawmaker Vladimir Medinsky told AFP, arguing that a Saint Petersburg burial was a part of the Lenin family’s will. United Russia has even set up a special website, http://www.goodbyelenin.ru, named after a 2003 German tragi-comedy about the fall of the Berlin Wall. Two-thirds of the respondents to the site’s survey said they wanted to see Lenin go. Though informal, the poll was confirmed by another study conducted by the respected Levada Centre, which showed that 56 per cent of those questioned favoured seeing the body removed from public viewing. But while it might make for good pre-election politics, a Kremlin official said last month that for now at least, Lenin was staying. “As far as I know, no decision on this subject has yet been reached, and none is forthcoming,” said Kremlin property manager Viktor Khrekov. Analysts say that while the issue is less poignant than it was a decade ago, government officials still raise the prospects of burying Lenin to draw in the country’s younger voters, some of whom have no memory of Soviet times. This is “an eternal debate that follows the recipe of uniting non-communist voters,” said Andrei Ryabov of the Carnegie Moscow Centre. Lenin or no Lenin, the country’s leftists have been losing members years, their ranks unable to pick up younger voters who either go with the Kremlin candidate or ignore politics altogether. Russia’s Communist Party received just 11.57 per cent of votes in the 2007 parliamentary elections and its candidate, Gennady Zyuganov, won just 17.72 per cent of the ballot when he ran for president the following year. But Russia’s more liberal forces take the debate further, arguing that the Soviet dictator Joseph Stalin — whose body once shared the mausoleum with Lenin – should also be removed from its place of honour in the Kremlin wall. “We have to get rid of all these symbols of the Soviet Union,” said former Soviet dissident Lyudmila Alexeyeva, 82. But there is little doubt that the mausoleum has already lost some of its appeal. Former Russian president Boris Yeltsin removed its guard of honour in 1993, and the communist shrine is no longer a place of mandatory visits for the country’s school children and kindergartners. The state also no longer assumes the cost of keeping Lenin’s body on display. The laboratory in charge of the process – an affiliate of a Soviet-era centre called the All-Russia Research Institute for Medicinal and Aromatic Plants – primarily receives its funding from communist organisers. The mausoleum is open to visitors four days a week between 10:00 am and 1:00 pm. Entrance is free, but there is a strict policy against pictures and video.